BRI1 and BAK1 are Receptor-Like Kinases (RLKs), one of the largest gene families in plants participating in various cell signal transduction from cell surface to cytoplasm with oligomerization and phosphorylation to regulate plant growth, development, immunity, and environmental responses. Based on the recent investigations on the BRI1 and BAK1 and other RLKs involving in the receptor complex formation, transphosphorylation, phosphorylation sites identification, downstream substrates identification, and so on, it is recovered that the receptors oligomerization and phosphorylation integrate multiple distinct signaling to realize signaling modulation, divergence, convergence, and specificity. The studies of the complex formation and phosphorylation of BRI1 and BAK1 uncovered the potential signaling transduction interface primarily composed of the RLKs. The general novel model will be helpful to understand the plant cell signal transduction networks. Keywords: BRI1, BAK1, RLK, Signal transduction, Phosphorylation, Oligomerization. Keywords:BRI1, BAK1, RLK, Signal transduction, Phosphorylation, Oligomerization. Abstract:BRI1 and BAK1 are Receptor-Like Kinases (RLKs), one of the largest gene families in plants participating in various cell signal transduction from cell surface to cytoplasm with oligomerization and phosphorylation to regulate plant growth, development, immunity, and environmental responses. Based on the recent investigations on the BRI1 and BAK1 and other RLKs involving in the receptor complex formation, transphosphorylation, phosphorylation sites identification, downstream substrates identification, and so on, it is recovered that the receptors oligomerization and phosphorylation integrate multiple distinct signaling to realize signaling modulation, divergence, convergence, and specificity. 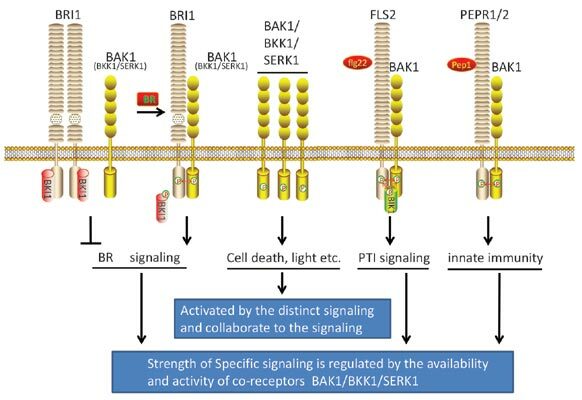 The studies of the complex formation and phosphorylation of BRI1 and BAK1 uncovered the potential signaling transduction interface primarily composed of the RLKs. The general novel model will be helpful to understand the plant cell signal transduction networks.